A 33-year old Baton Rouge Police Officer lost his life at approximately 11:30 PM, on Monday, February 25, 2008 from injuries sustained in a motor vehicle accident. 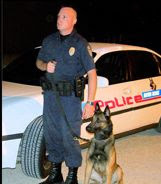 Louisiana State Police reported that K-9 Officer Corporal Mark Beck, crashed his 2005 Chevy Impala police cruiser into the back of a tractor-trailer stopped at a railroad crossing. Corporal Beck was transported from the scene of the accident in the East Baton Rouge Parish via Acadian Air Med to the Earl K. Long Hospital where he was pronounced dead. A 1996 Freightliner tractor-trailer carrying methanol was northbound on US 61 when it approached the railroad tracks and came to a stop as required by law due to the nature of the cargo. The driver had activated his hazard lights prior to stopping but for some unknown reason the police cruiser impacted the rear of the tractor-trailer. The driver of the Freightliner was not injured however Corporal Beck's K-9 partner is being treated for injuries received in the crash. Late Tuesday, Beck's car was taken to the police garage, where it will be looked over by Louisiana State Police in an attempt to determine the cause of the crash. Chief Jeff LeDuff of the Baton Rouge Police Department said of Corporal Beck "... his dream was to become a dog handler, a K-9 officer in a big department like Baton Rouge, and be part of that team. And tomorrow (February 27th) would be one year that he had been a member of that team." The Chief has asked the department to stand together and he wants the public to stand with them, "To the community, I beg you - put your hand on my guys' back and help me hold them up." Corporal Beck is the fourth Baton Rouge police officer to die in the line of duty since 2004. He leaves behind his wife, a former police officer, two sons ages 10 and 7 and a a 17-year old niece that raised as his own. Once again, I ask you to remember the family and fellow officers of yet another fallen hero whose time came way too soon. This is just so sad, as are all of your tributes to fallen officers. God bless this man and his family. It's so sad to see another law enforcement officer fall in the line of duty. Like you said, the list is growing far too fast.